Liebert MC Microchannel Outdoor Condenser, 28 – 220kW, is an outdoor air-cooled condenser that provides higher efficiency, while using less refrigerant. 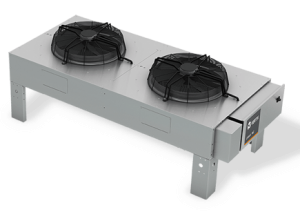 Features such as variable speed fans, advanced controls and a microchannel coil make this efficient, quite air cooled condenser system uniquely innovative. With the exclusive coil design, this condenser offers a highly efficient, system matched heat rejection solution that reduces energy costs and operational expenses. Liebert MC condenser operates with higher efficiency than fin and tube condensers, with an annual savings of up to 85%. The savings are even greater when the flooded receiver system winter operation option is applied. The MC features an aluminum MC coil with a variable speed fan for each coil section. Constructed with an aluminum cabinet, the MC is a low-profile, direct-drive, propeller fan-type unit suitable for mounting outdoors. It provides for the heat rejection of either one or two separate refrigeration circuits, matching heat rejection capacity varying with the outdoor ambient temperatures and with each corresponding compressor’s heat rejection requirements. The unit is quiet and corrosion resistant. Copper pipe connections are provided for brazing of copper field piping. Connections are located next to the electrical panel. All electrical connections and controls are enclosed in an integral weatherproof section of the condenser.